You know I've searched and searched for cory's (lower case "c" is deliberate) condemnation of Rep. Joe Wilson's yelling, "You lie!" at President Obama during his address to a joint session of congress to no avail. On the contrary, what I did find is that cory voted against the congressional rebuke of Wilson when it came before the House. Gardner is upset that they did not cheer when Trump declared war on socialism….. Exactly how stupid is he. Does the fact that AOC and some of her colleagues dressed in white were self-professed socialists give Cory a clue as to why AOC and her colleagues did not cheer for that sound bite? Good boy, Cory! Stay loyal to Trump, and Trump will stay loyal to you. Pay no neverminds to all those former loyalists lying under all those buses. Stay Strong Senator. Some day, they will thank you! 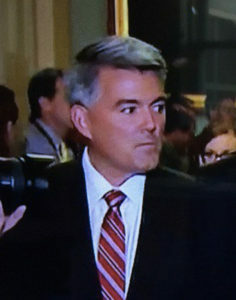 Gardner embarrasses the state of Colorado. We are better than Trump and Gardner and we'll show Gardner just in 2020. I guess he didn't get a clue when we voted against the draft dodging traitor in 2016. Or against his whole party in 2018.